Yes you heard that right.Get tickets to see Santa’s New Sleigh and you could become a certified Master Sleigh Builder Oh and you also get to meet the big man himself. I caught up with the producer Sam Bradshaw to find out about this magical offer. Right up until Christmas Eve, two troubled elves, Sprocket and Dibs, are calling on families to help them solve the very serious problem of Santa’s missing sleigh. In the end there’s nothing else for it but to build a new one, and that’s where you, the audience, can help out, with lots of singing and laughter along the way. 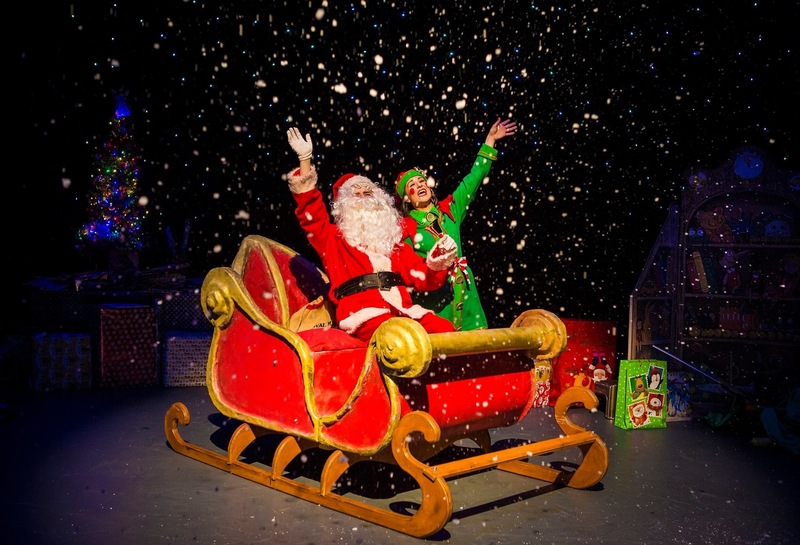 This festive treat comes from Sam Bradshaw Productions, who are on tour again after sell-out seasons in Lichfield, Peterborough and the West End’s Arts Theatre. Santa’s New Sleigh was first created for The Curve in Leicester. Sam was playing Stinky Pete the Pirate in a production of Peter Pan in Shrewsbury when he was asked by the Dame, Brad Fitt he’d like to produce the children’s show with him. What first began as a 40-minute story featuring Jingle Bells has developed into an hour-long show with its own original songs. There’s plenty of audience participation, with children invited on to the stage to open the advent calendar doors and Dads plucked out to be reindeer pulling the sleigh. At the end there’s a meet and greet with Santa and every child gets a present. Sam has plenty of experience knowing how to create engaging productions for kids as he first became a children’s entertainer at just 13. He can walk on stilts, ride a unicycle and juggle knives. Sam loves his role of half-creative, half-businessman. In between productions he performs on cruise ships and runs a children’s entertainment business in London. Most exciting of all, though, is the news that he’s working on a David Walliams title. No wonder he’s good at juggling. in the Winter Gardens complex and was part of the original 1878 build. Santa’s New Sleigh is ideal for kids of all ages, including their parents.